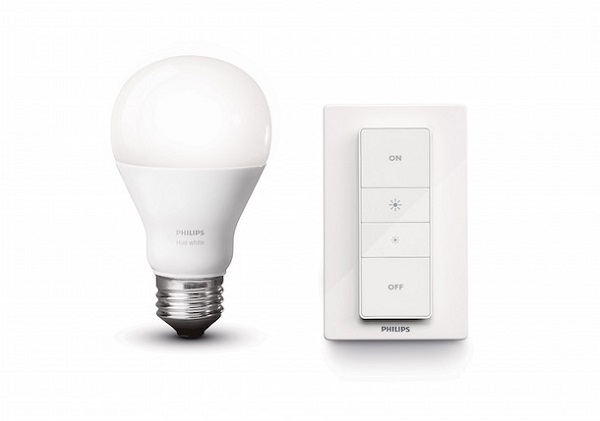 Philips launches Hue wireless dimming kit. Today Royal Philips, the global leader in lighting, introduces Hue wireless dimming kit, the easiest smartest way to get flawless dimmable light at home. The Philips Hue wireless dimming kit is a no installation, straight out of the box solution for perfectly dimmable lights in your home without having to move from the sofa. The Philips Hue wireless dimming kit is €39.95/~$46, individual Philips Hue white bulb is €19.95/~$23 - available in Europe from September 2015. Each kit comes with a Philips Hue white light bulb and a portable battery-operated dimmer switch. This means that you can now modernize your home lighting without the need to call an electrician or open up walls to access wiring; particularly useful if you rent your home. Getting ambiance at home has never been so simple; just screw in your bulb and press the dimmer switch to create your own personal dimmable glow. You can use the dimmer switch as a normal wall switch, or take it from the base plate and use it as a remote control for optimal convenience as it can be easily placed anywhere you desire. Plus, you don't have to get off the sofa to dim the lights anymore when watching your favorite TV show; you can even lower the lights from the warmth of your bed. Traditional LED dimmers are often expensive to replace and can result in lights that flicker and buzz. The Philips Hue wireless dimming kit offers the flawless dimming expected from Philips LED bulbs. The remote control is guaranteed to change the brightness of the Philips Hue white bulb with absolutely no flicker and perfect dimming until it is off. It is also possible to control up to 10 Philips Hue white lights at the same time, so you can easily change and adjust the brightness of a whole room. It is easy to connect any Philips Hue compatible products already in your home to the dimmer switch through the Philips Hue bridge.